The holiday shopping season is in full swing now and consumers immerse ourselves into the shopping spree to spend far more on gifts and impulse purchases than they usually do throughout the year. The eMarketer survey estimates that in 2017, November and December will account for 23.6% of full-year ecommerce sales. 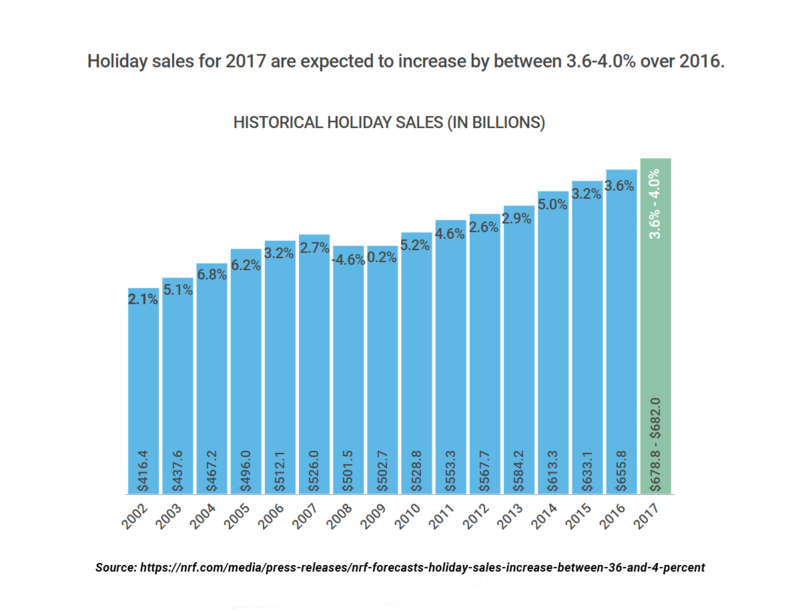 This year’s retails sales are expected to grow compared to the same 2016 holiday period. The percentage varies, but many reviews come up with quite similar figures – 3.8% sales growth prediction by eMarketer and between 3.6% and 4% increase in sales according to National Retail Federation forecast. In the mid-November we highlighted the general tendencies you should follow to stand out throughout this holiday season. Now we are going to hit the high points that help you leverage every single aspect of your eCommerce web store performance. Make sure you stick to all the checklist recommendations to get yourself prepared for the hottest shopping time of the year. It is high time to measure the output results you had last year. Think over the positive gains you achieved in 2016 to find a surefire way to succeed in 2017. Do not forget to ask yourself about what went wrong that time. Review and adjust your sales and marketing strategy to avoid the weak points you experienced before. Knowing the last year’s results help you fine-tune your targeting approach this year. Segment your customers so that you can focus only on the most prospective target groups. In spite of the fact the early shoppers have already gone, you still can make a fortune on impulse purchases and discount offers. You can be sure about it, since the experts believe that a longer shopper season along with strong consumer confidence can deliver retailer robust revenues this year. Mobile purchases continue to rise this year’s holiday period – with 66% of orders made via a phone or tablet during Thanksgiving Day and Black Friday that is up from 58% in 2016. The desktop sales keep on dropping and account only for 34% – lower than the last year’s stats of 42%. In order not to lose your mobile shoppers, try to do your best to optimize the eCommerce store so that it can be easily navigated on any displays across various devices. It is a commonplace situation when e-merchant has a wide range of products to offer on his web store, but the way products are arranged leaves much to be desired. Prospective customers just get bored trying to trudge through obscure categories and sections. Orchestrate your goods into clear groups, apply simple filters so to make the search process pure and simple for your website visitors. Enable and edit side menu bars, pop-up windows, etc. 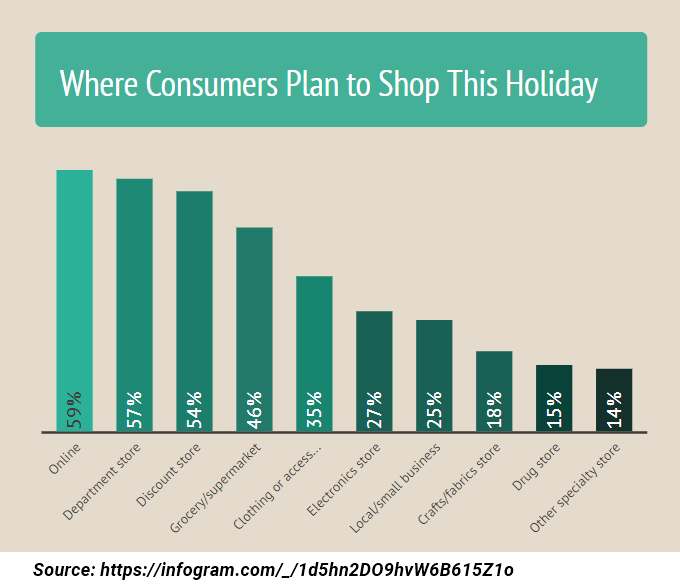 to help consumers narrow down their searches with an eye on their holiday shopping priorities. SEO or Search Engine Optimization, being once innovative, has long since proved its efficiency and become common practice in eCommerce. Every online business strives to increase its Google rankings to be at the top of search results. Revise your overall SEO strategy, optimize your website content, improve it with relevant blog posts and publications. Make sure you perfectly know Google and Bing web ranking policies in order not to violate some of them. Utilize analytic tools to realize what are the right and the most frequent keywords that people use during the holiday season. Crashes and downtime are quite usual things when it comes to holiday shopping spree. With many website visitors on your server, no matter it is cloud or self-maintained, you will definitely suffer from overloading that results in various glitches and freezes. And you can mark my words that the lead churn will be dramatic, since no one is going to tolerate such operational discrepancies. So test your system to prove its stability, get in touch with your hosting provider to have their firm guarantees of proper server performance. Once your system is steadfast, you can concentrate on marketing improvements. Since the shopping cart abandonment issue skyrockets every holiday season, try to brainstorm with your marketing and sales teams to find the optimization means. Make the shopping journey shorter and more precise – reconsider the checkout process, include discount offers and shipping costs, add actionable payment methods. If your marketers can manage a follow-up emailing campaign – it also helps return a lot of shoppers to your web store. Ensure your eCommerce platform has got all the necessary extensions to assist you in managing web store inventory items. People hate being told that some of goods are out of stock, especially when they are done with their shopping choice. Integrate additional inventory software that can orchestrate all your SKUs in a clear yet efficient manner. Holiday shoppers need to know what products are available at the moments, how many units they can buy, what are the retail and small wholesale prices, etc. Put everything in order to engage lead conversion. The previous years’ stats revealed that 51% of shoppers had failed to complete an online order because of poor delivery choices. With so many holiday offers on the market, people will never opt for your web store if shipping terms are unfair or delivery methods are scarce. On the other hand, too many options won’t do any good for your eCommerce project either as customers getting overwhelmed with fulfillment process. Harness your website with crystal clear payment options, shipping costs and delivery dates so to guide your customers through the meaningful ordering routine. The holiday period is the hottest time for client support services representatives as well. Quite often people address customer service requiring some help with making orders or picking the right model/size/color of the product they are going to buy. This is when your support service managers are supposed to show their skills and provide assistance to improve customer experience. Train them how to deliver your brand value to customers and compose an actionable script that increases engagement and conversion rate and improves the sales funnel. Update, if needed, your FAQ and Q&A sections on the site, embed a live web chat, enable a separate phone number for service cases. Go to the Contact Us page to check if the working hours, office location, legal info and other details are vividly shown. That’s all for now and if you are through all these 10 points and tick them before the holiday period is over, your online business will definitely bring in much more revenue at the end of the day. Should you need assistance in integrating the right software to empower your eCommerce platform, just contact us to get a perfect web store in on time.